The Urban Critic: This week Mayor Bill De Blasio announced an overhaul of the 10 year plan for the New York City Housing Authority’s cash and building infrastructure crisis. The specifics of this plan can be sourced (HERE) for the reader to gain an overall knowledge, but here at our blog, we are particularly interested in one aspect of this proposal: The leasing of land located in Public Housing developments for the construction of new housing which will target lower to middle income residents. This plan, in all respects, is a good one with solid backing and is well intended. The strategy would call for the construction of new residential buildings in-between existing (but decrepit) public housing towers. In theory, adding new housing to a City which desperately needs it can only be a net positive. The flaw in this approach is the lack of a solution for all of the existing housing which is in complete disrepair. Asbestos laden, mold infested and with crumbling infrastructure; These buildings built during the 40’s, 50’s and 60’s deserve to be a part of this overall masterplan. Namely, they should be systematically removed and demolished as new housing is built. In turn, residents of these aging structures should be moved, building by building, into these newly constructed housing blocks in order to avoid societal displacement. Existing NYCHA buildings are a monetary drain on The City and its resources. The cost to maintain and upgrade is prohibitive and in many ways the new plan underserves the residents of existing NYCHA buildings by granting housing to those on a backlog instead of improving the lives of current tenants. We argue that both can be done in simultaneous fashion. The City can construct twice the amount of new building stock adjacent to the existing housing (there is plenty of space), then move the residents of these buildings into them once they are finished. There would also be a surplus of new housing for population waiting in the lottery. It could be a win-win. The point being is that part of the plan should address the third world living conditions currently existing, and not just kick this issue down the road. In order to improve on The Urban Condition from society’s standpoint, improved housing should be a right for ALL. You can read more on Mayor De Blasio’s plan HERE from the New York Observer. 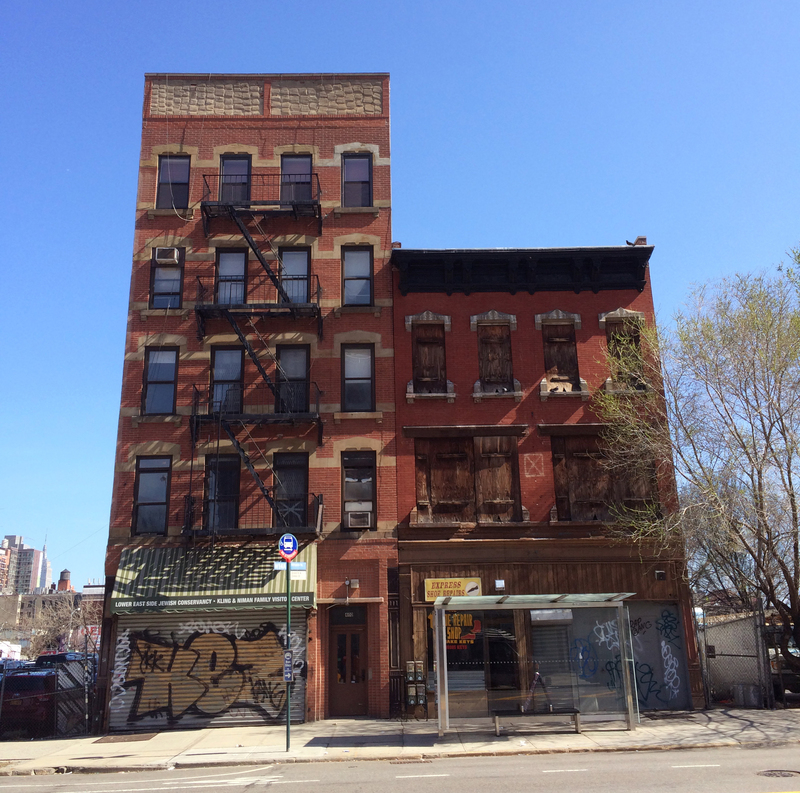 The Urban Critic: Delancey Street, in New York’s Lower East Side, has been known for its rough around the edges aesthetic, and below the radar neighborhood status for the majority of New Yorker’s. 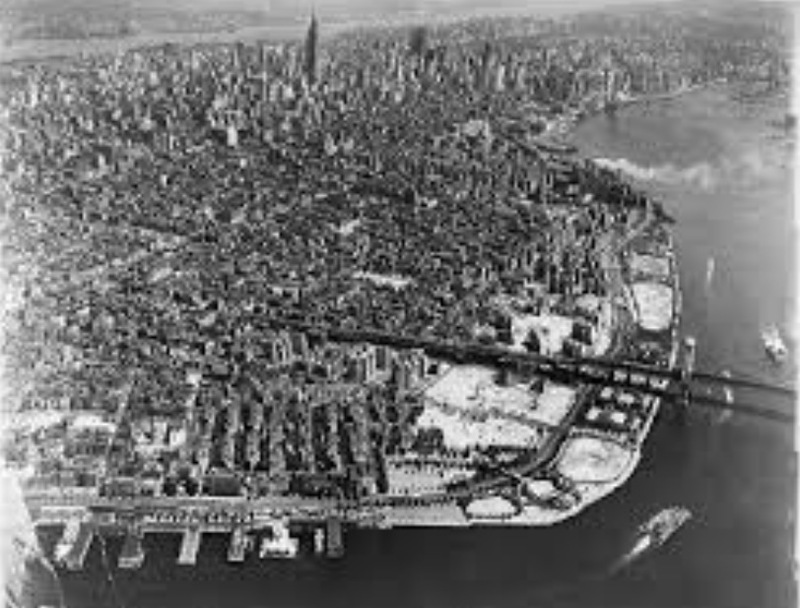 Its Far East Side location, at the foot of the Williamsburg Bridge, has been kind of a no-man’s land for many decades after the demolition of multiple city blocks in the name of Urban Renewal. Of Note: These demolished city blocks are now under development as the future Essex Crossing, which we critiqued in our prior post A Bait and Switch in The Lower East Side. Where the Essex Crossing development lacks in clarity across Delancey, this fortress of glass rising across the street (at 100 Norfolk Street) harnesses the current trend of Air Rights Transfers in New York and takes this real estate trick to a new level. 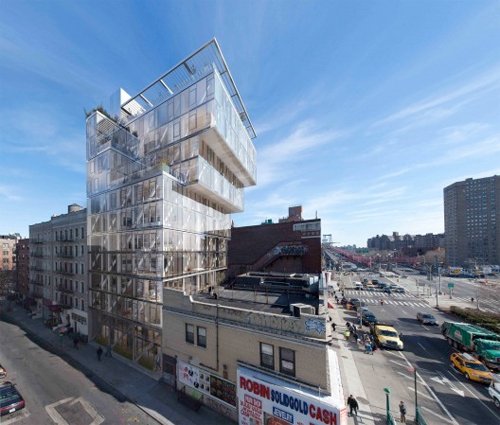 By exposing all aspects of building structure and packaging it into a powerful building Form, this cantilevered condo tower takes an aggressive position of iconography in a rapidly changing Lower East Side. In a lot of respects, this position is welcome. Oftentimes, the softer side of architectural expression takes over with the contribution of community organizations and neighborhood input. Watered down versions of friendly building forms with developer-grade facades becomes the expectation. Since this is the prevailing trend in Our Changing City, the definition of powerful architecture gets lost. The Cantilevered building on Delancey falls into the category of a F#ck You building. It positions itself as an “edge” structure, in a fringe neighborhood; Not quite sure of itself, but taking a position by pushing boundaries. Its fragmented form, a building type we’ve highlighted before in Jenga Box Rising, bucks the notion of traditional residential architecture and elevates it into the realm of Fragmented Realism. And while this notion of fragmentation is oftentimes disturbing to the viewer, provoking feelings of unease and imbalance; It is precisely what society needs in order to keep moving in a progressive direction. The F#ck You building is a provocation, an Urban Experiment. It questions the everyday challenges of living in a complex and mutable city, and solidifies these challenges into a three dimensional Urban Form, soon to rise on the fringes of Delancey. 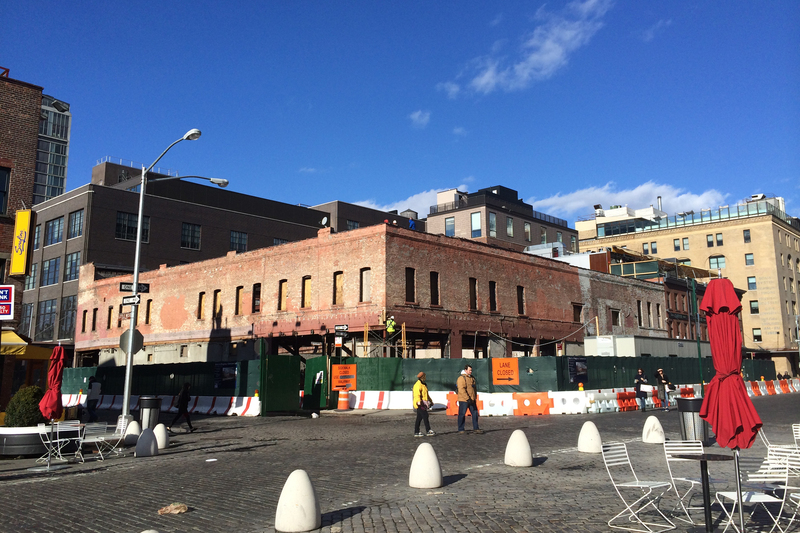 Last week, the first four buildings of the long awaited Essex Crossing development were revealed to the public. If one word could sum up the general feeling of the images, it would be: Disappointing. Some background context should be given: When the Megaproject vision was initially released to the public in September 2013, the project was presented as one unifying design for the multi-block development. The vision was executed by a singular firm (SHoP Architects) and while not immensely exciting, the vision still conveyed a sense that this was a solid urban infill project. The architecture and general design were relatively strong. The buildings, while not potential award winners, were stout boxes on podiums with gardens and pedestrian flow throughout. It looked convincing for an area of The City that has lacked so much for so long; A vast Urban swath which was cleared of Tenement housing in the 1960’s under a failed renewal plan. Fast forward to last weeks’ rendering releases of the first four superblock developments and one can only think that something was lost. As part of the Essex Crossing developer agreement, the buildings were broken out as separate parcels with different architects. This idea, in theory, would diversify the appearance of the architecture and the surrounding environment. Although, In typical developer fashion, the buildings took the form of the Everyday New York developer building. In the effort to diversify, they have instead all moved toward looking the same, and downgraded. 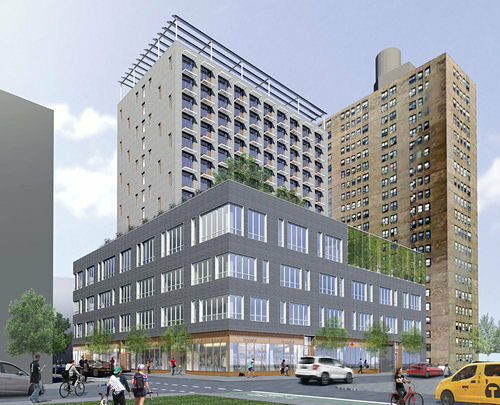 While still providing great amenities for the neighborhood (a new movie theatre, relocated Essex Street Market, affordable housing for seniors), the project does not deserve to be watered down by Mediocrity. Mediocrity in Architecture has recently been so pervasive in New York that one only has to turn their head to see another boring developer building rising in sight. The brick is all the same, the windows are nondescript. There is a flatness to the facades which scream of construction efficiency. If there is a time to get it back to right, the time seems to be now. This development site is still fallow and not a shovel has been lifted. This time will soon pass within the next few months and the blocks will be abuzz with activity. This is a moment for the neighborhood and architecture community to rally for better design in our neighborhoods and surrounding environment. Urban Infill buildings, when thoughtfully executed, can serve communities in wonderful and meaningful ways. And while never intending to break ground as buildings of beauty, they can still be designed and constructed in a manner which elevates the surrounding Urban context. They can be nice to look at from a distance and also up close. 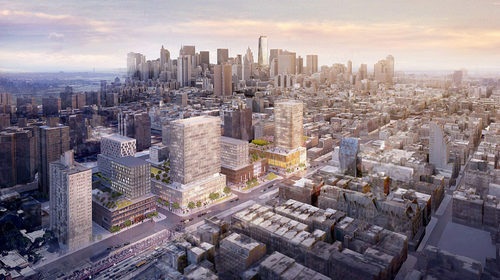 These renderings reveal that the Essex Crossing Development is currently going through a developer “bait and switch”. While exciting and convincing to The Public at the onset, these buildings have suffered at the hand of the profiteering developer. This is the time to ask for more. Because soon, Mediocrity will be built and around us for the next One Hundred Years. 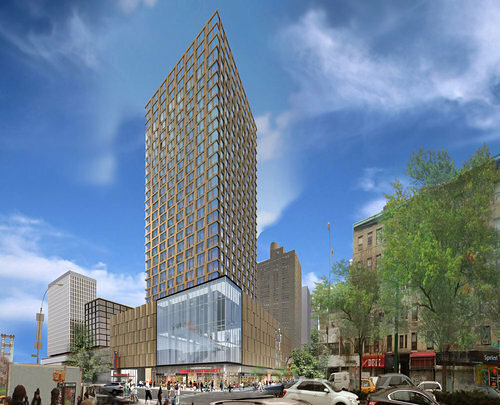 The time for the public to speak about the design of the Essex Crossing Development is NOW. There will be a community presentation to the public by Delancey Street Associates and CB3 (Community Board 3) this Wednesday, January 28th from 6-8PM at Grand Street Settlement. 80 Pitt Street. New York. 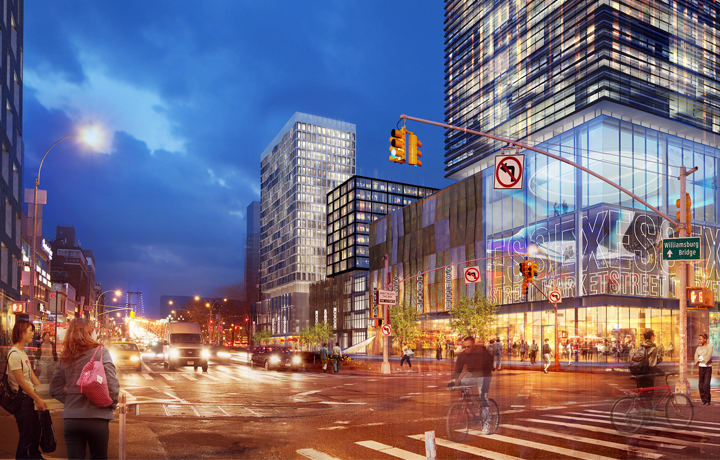 Link to the Essex Crossing website with initial project release renderings. 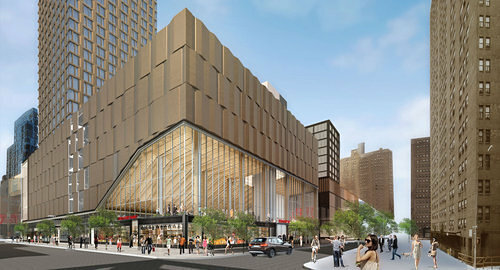 Link to the rendering releases on New York Curbed. 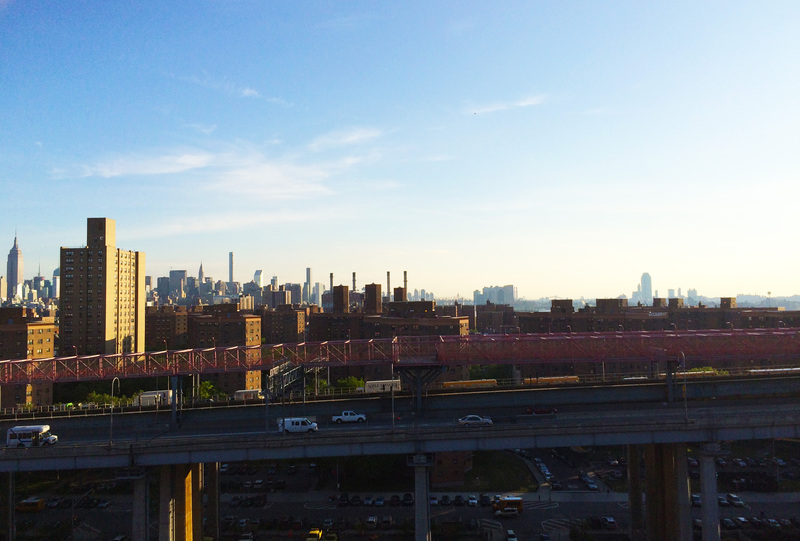 Link to Gordon’s Urban Morphology’s commentary on another mediocre project, the Westside Beasts, on New York’s West Side. 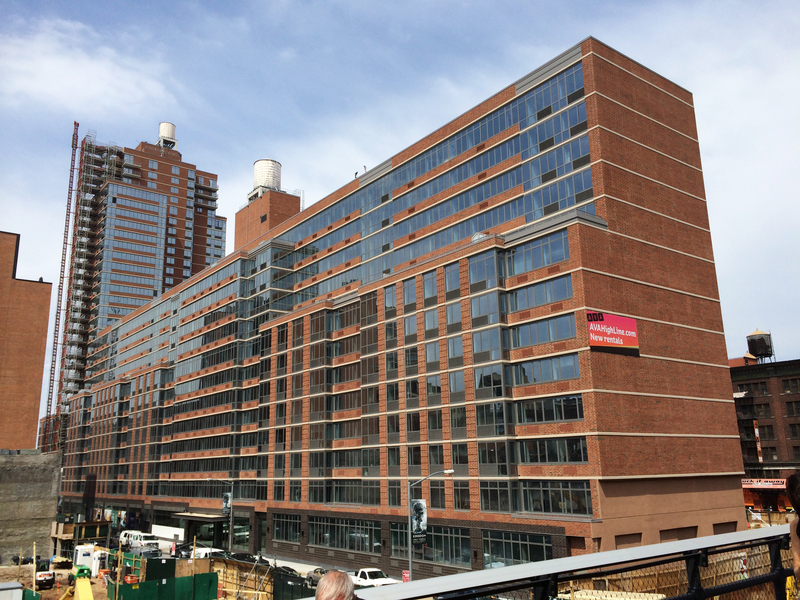 The Urban Critic: As many have noted about the Meatpacking District, the transition from gritty industrial fringe to Over-The-Top trendy neighborhood has almost been completed. Enter here, the newest structure under renovation, an old industrial building which housed the former eatery Pastis over the past 15 years or so. It is now being hallowed out to make way for a Restoration Hardware and hotel. A Restoration Hardware! So it goes in the neighborhoods of Manhattan where once unique eateries and one of a kind stores are being pushed out by the forces of big money. Suffice to say, the renderings of the actual building have ended up in a pretty good place. The proportions of the original structure were kept in tact. The pedestrian scale is maintained. And a more modern, industrial glass cube rests on top, slightly pulled away from the street, giving the red brick facade some room to breathe. 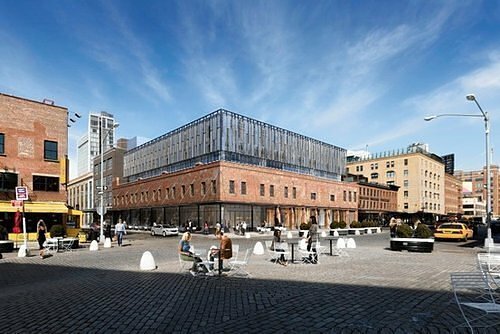 As new buildings go in Manhattan, which these days have a tendency to destroy entire city blocks (reference our prior post on Beasts of The Westside), this conversion from former Industry House, to fashion eatery, and now Restoration Hardware has taken an interesting turn. The New York City Landmarks Commission made the architects go back to the drawing board a few times to get it right. In this case, it looks like they ended up with a perfectly respectable new urban neighbor. In a follow up to our Urban Critic article on The 5 Pointz Follies, Aymann Ismail from the wildly interesting blog ANIMAL New York captured the demise of the Graffiti Art collective in a captivating 1 minute time lapse video. An emblem of the clean slate demolition techniques that amplify the Gentrification conversation in Our Changing City; The 5 Pointz demolition was especially sad because it was a container for so much countercultural expression. Now, we will have brand new hideous condominiums, and one more memory place lost to the forces of growth and an increasingly insatiable appetite for bad developer driven design. It’s time to amplify the argument for responsible development in The Evolving City. ANIMAL New York. Culture and politics, straight from the gut. Link to The Urban Critic and The 5 Pointz Follies, from Gordon’s Urban Morphology. Thanks to the readers of our blog. Gordon’s Urban Morphology has gained a steady readership month over month and we look forward to bringing more stories about New York’s building culture to our pages in 2015. It looks to be a busy year! 2014 has shaped up to be a very interesting one in New York. As the development cycle heats up across the City, we expect more stories to be told through the changes in our Urban Form, as well as the many personal and cultural stories that go along with this change across The City landscape. Our most popular post of 2014 which garnered the most clicks: Readers took great interest, especially International ones, in Corlears Hook, Forgotten Corner of The Lower East Side. 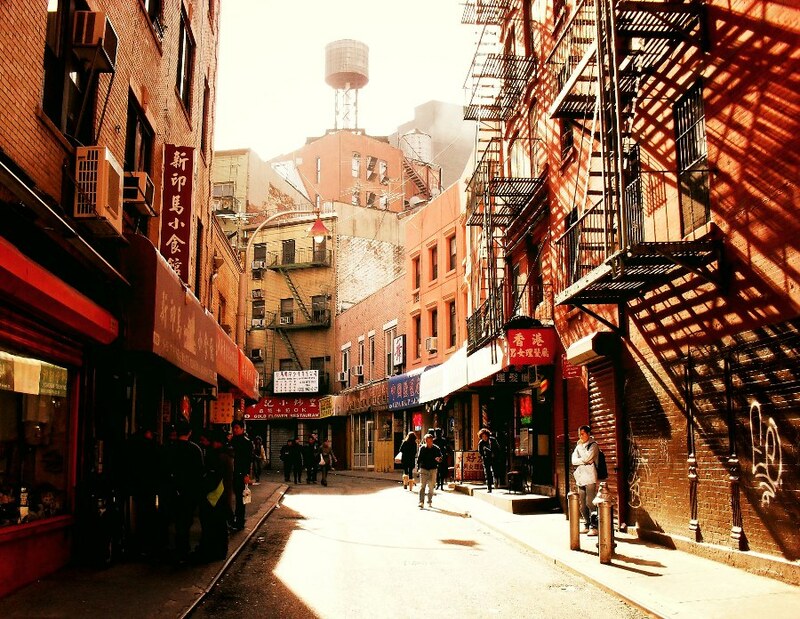 Another popular post which drew International readers took us deep into the heart of Murder Alley, Chinatown. Two Tenements, Standing dove deeper into the meaning of The Tenement in society, before the wrecking ball comes for the Upcoming Essex Crossing Development in New York’s Lower East Side. 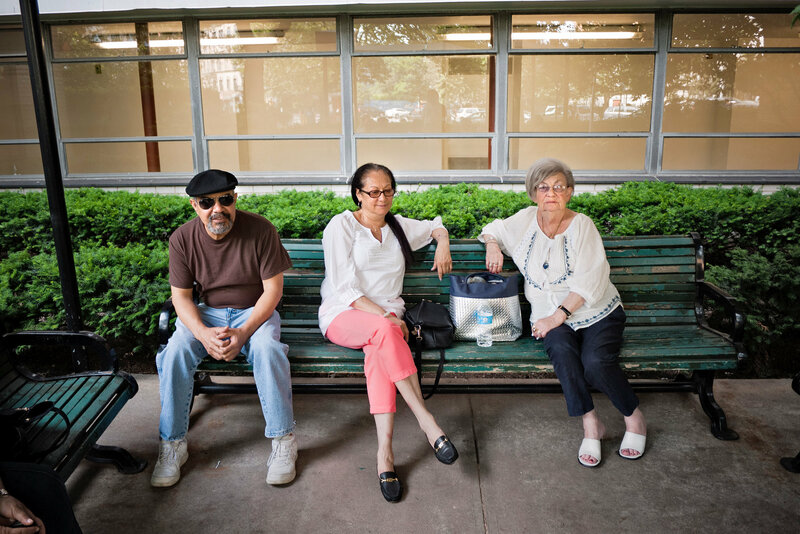 And continuing in The Lower East Side, our blog took personal interest in a New York Times article about life in Coop Villge, and wondered about the meaning of living in a NORC (Naturally Occurring Retirement Community) in Our Lower, Lower East Side. 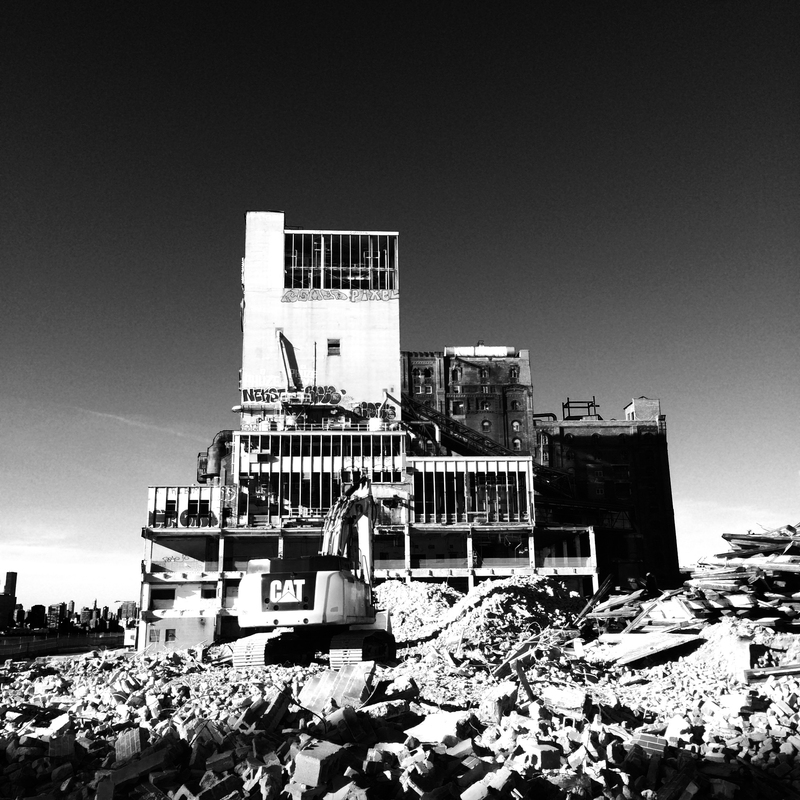 Across the East River, we watched the demolition of the Domino Sugar Factory to clear the way for a new housing development in Domino Sugar, Down. This trend toward larger and more significant development on the Brooklyn waterfront continues the gentrification wave sweeping across The City. 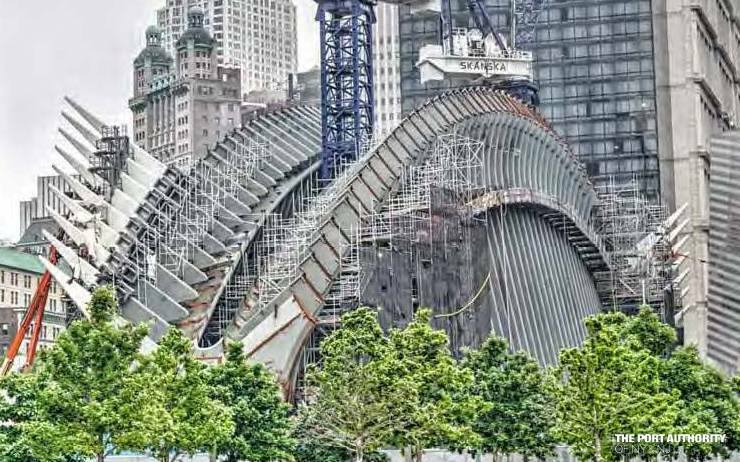 And at The World Trade Center site, many of us watched in awe as Santiago Calatrava’s new transit hub rose from the ground. It’s alien form has made it an instant landmark. Our take on the building’s appearance was written about in The Serpent of The Trade. We were sensing that the gentrification wave has gone too far and has left our new buildings lacking personality in one of our favorite posts, Beasts of The West Side. And back at The Trade Center We felt that The New York Times review of One World Trade was a bit one dimensional, considering it is a National Symbol. Our impression of The Times article struck a few chords with readers in A Flawed Review of A National Symbol. So, there you have our year’s top posts. Thanks again for your readership and we’ll see you in 2015. Happy New Year from Gordon’s Urban Morphology! A debate is circulating about a marketing ploy for a downtown condo building, 15 Renwick Street, now dubbed the Steampunk building. Geared toward the hipster creative class, the ad campaign has created a stir surrounding class warfare in an increasingly class stratified City. To many, this campaign has no bearing to the average New Yorker, as it reaches into the category of lifestyle-as-fetish or high performance art. To live here is, in this particular place, is an exceptionally curated experience, which begs the question; What ever happened to just sitting in the living room and watching TV? 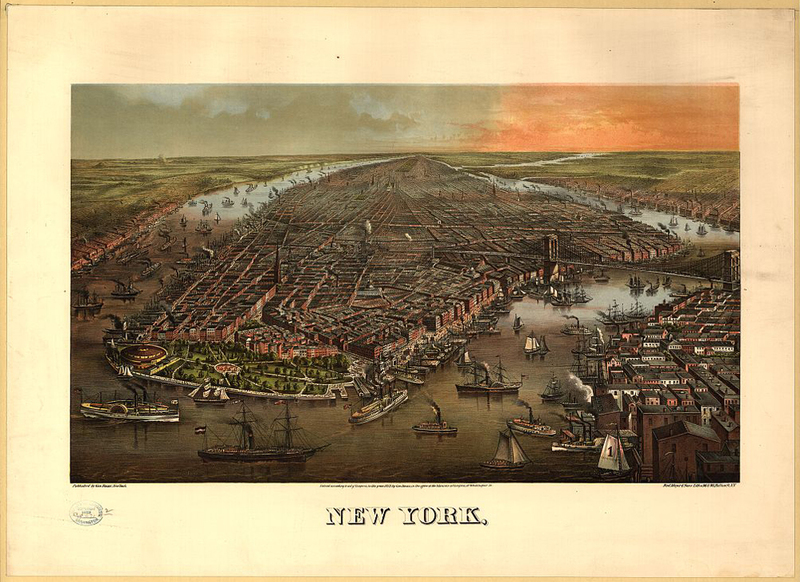 The idea of New York as a fantasy has reached fever pitch. Lifestyles of the everyday are cast aside for a more glamourized version of Fantasy. The “City as a Theme” has its roots in the Times Square makeover, some would say a Disneyfied version of the lawless jungle it once was. So for 15 Renwick, Queue Disney & The Pirates of The Caribbean; Presented as the Steampunk lair on the Lower West Side of Manhattan. Not that this is bad. One can say this marketing tact has been quite effective by generating buzz. Who would ever think to reside at this place in this particular location (at the entrance to The Holland Tunnel)? A popular article which is circulating by Citylab and authored by Kristen Capps calls into question the devaluing of the American psyche by the Steampunk campaign. You can read about it HERE to form an opinion. The article’s take is quite enlightening, but the author seems to forget that this is in fact New York. Glamour and fantasy are part of the allure. Objects of beauty abound. This is the birthplace of modern marketing (if you can make it here you can make it anywhere?) Does this pitch ring familiar? 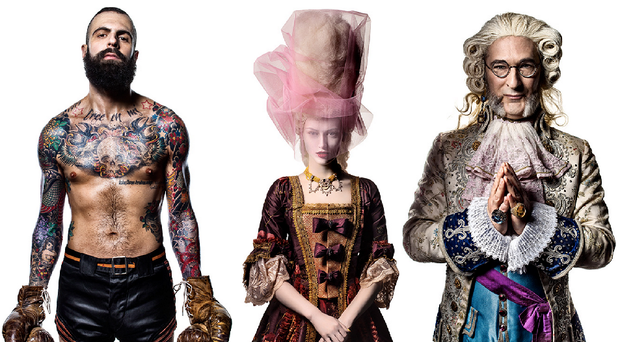 To the Steampunk Ad campaign of 2014: kudos’ to selling an illusion that everyone knows is fake. And to those who think this may be the anti-gentrification rattle saber’s nail-in-the coffin: Who cares what goes on behind closed doors? And for the One’s who can dress in Victorian era dresses, peering out through telescopes across the choking smog of The Holland Tunnel: Now you can have your cake and eat it too. Citylab article on the cultural affect of the Steampunk marketing campaign. A link to the Steampunk website, if you are wondering what exactly this phenomenon is. ODA Architecture link to 15 Renwick Street. The Lower East Side's most influential news source.